Avoid isolation, and if you are feeling low, reach out for help. But there is also plenty about the holiday season that isn’t included in beloved melodies. For many people, this time of year sets them on an emotional rollercoaster that may be marked by feelings of loneliness, sadness, guilt, grief, and anxiety. 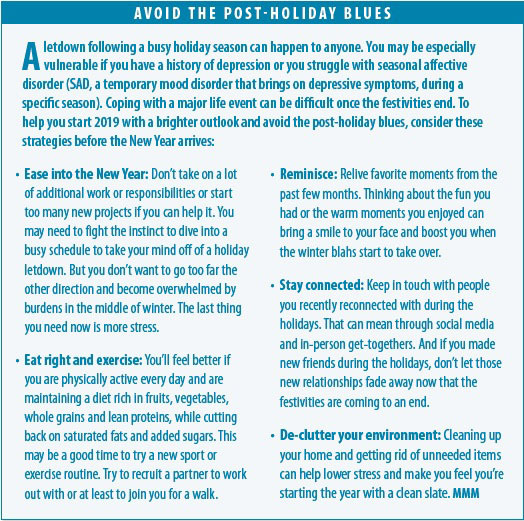 Recognizing those feelings and the behaviors that follow is critical in working through them and, in many cases, overcoming them to find joy during the holidays, explains Paola Pedrelli, PhD, Director of Dual Diagnoses Research at Massachusetts General Hospital (MGH). She adds that it’s also important to continue doing the things that normally make you happy, even if those activities don’t seem as appealing this time of year or you are less motivated to do them. You may find that interacting with friends and relatives, maintaining your usual exercise routines, and continuing with hobbies, may keep your spirits higher than you expect. With all the hype that accompanies the holiday season, you may be counting on family reunions, gift giving (and receiving), and all celebrations to be the stuff of a Norman Rockwell painting or a TV movie with a guaranteed happy ending. Of course, experience teaches us that the holidays don’t always runÊsmoothly. Dr. Pedrelli says it’s important to remember that, despite all the smiling faces you might see on Facebook or on TV commercials, this time of year presents a mix of challenges and good times for most people. Thinking that you should always be happy and upbeat during the holidays because everyone else is feeling that way is unrealistic and an inaccurate understanding of the difficulties faced by others. It’s also important to know what triggers feelings of sadness and anxiety inÊyou. Enjoy Alcohol and Food in Moderation: While it can have the temporary effect of relaxing party guests wanting to make merry, alcohol is a depressant. Relying on it to get through a stressful period can lead to dependence, as well as alcohol-related issues, such as drunken driving, falls, and regrettable behavior. Know your limits. The general guideline of one drink per day for women and two for men is a healthy rule to follow. Likewise, to avoid guilt, as well as physical health complications, try to eat wisely, too. Smaller portions allow you to enjoy a variety of goodies with a little less caloric intake. Don’t Take on Too Much: It’s easy to overcommit during the holidays. Be willing to say no to some invitations and don’t volunteer for more than your schedule and peace of mind will allow. Feeling like you have to be in two places at once or committing more of your energy, time, and money than is reasonable can keep you stressed for a long time. Pace yourself. Give yourself the gift of relaxation during this time. If you don’t have a friend or family member with whom you are comfortable talking about your feelings, consider seeing a mental health professional. You don’t have to start with a psychiatrist or psychologist. A local community center or health clinic may have mental health services. You may feel more at ease talking with a member of the clergy. The important thing is to share your feelings with someone who can help you sort themÊout. An outside voice may also be able to help you understand that it’s quite normal to feel sad or overwhelmed these days. “It is important to express our feelings to others and to remember that there are others who unfortunately struggle during the holidays,” Dr. Pedrelli says, adding that it’s especially important to open up about your feelings if you have a history of depression, anxiety or if you have recently been through a difficult period in your life. Some of the most appealing parts of the holidays are the traditions: the meals you’ve enjoyed since childhood, old decorations that conjure up warm memories, and gathering at a particular relative’s home for annual festivities. Traditions help us maintain family ties and link our lives today with how we celebrated the holidays when we were young. But if some of the things you do every holiday season fill you with dread or anxiety, or represent more work than you can handle, it may be time for a change. If hosting Thanksgiving dinner for the entire family has become too much, then talk with a close relative about a “changing of the guard.” Volunteer to bring dessert, for example, but let someone else handle hosting duties for a while. Starting a new tradition can be a positive thing, and you shouldn’t feel guilty about initiating something different. Dr. Pedrelli acknowledges that if the person who passed away is a partner or someone you used to live with, the holiday will be even harder because people may experience a significant change in how they live through the holiday. “They will feel lonely more of the time and may have more triggers for sadness,” she says. Financial difficulties may also change people’s holiday habits. For example, some people may not be able to afford to visit family they used to spend the holidays with. If you start to feel pressure or guilt about enjoying the holidays, remember that these are also just days on the calendar. Your best time of the year may be in the summer, so make the best of things now and look forward to whatever fun lies ahead. You can get through the holiday season. Your best strategy may be finding joy in the little things, like the smiles of excited children or a cup of coffee while you’re warm inside and snow is blowing outside. Try to relish the small moments in between the big celebrations. Tags alcohol, anxiety, children, coffee, depression, depression anxiety, exercise, exercise routines, food, health, mental health, sad, symptoms of depression.